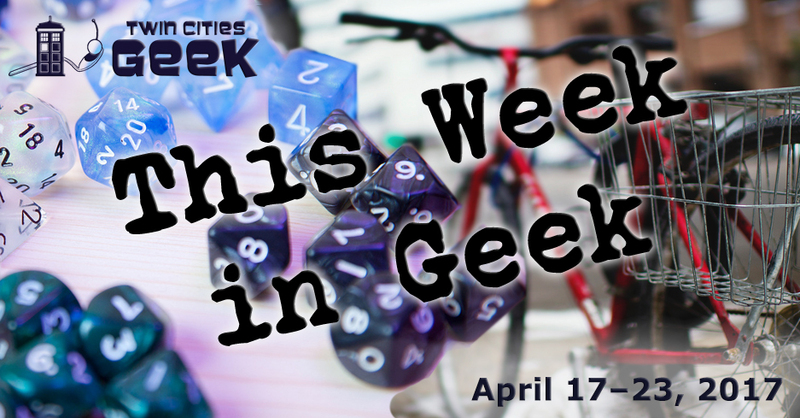 Welcome to This Week in Geek, your guide to events of interest to the Minnesota geek community for the week of Monday April 17th through Sunday, April 23rd. When: Monday, April 17th at 6:30 p.m. When: Tuesday, April 18th at 5:00 p.m. Learn about the art of World War 1 with this free happy hour event at the Minnesota History Center. Visit the new WW1 America exhibit and see art, music, and film that defined the era. The event features WW1 poster printing, dazzle-paint mask making, a screening of Charlie Chaplin’s The Immigrant, and more. When: Tuesday, April 18th at 6:00 p.m. When: Tuesday, April 18th at 7:00 p.m.
Café Scientifique, presented by the Bell Museum of Natural History, is “a happy hour exchange of ideas about science, environment, and popular culture featuring experts from a variety of fields on diverse and often provocative topics.” This month’s theme is “Crocodilian Superdads: Gharial on the Chambal River in North India,” a scaly dive into the lives of 18-foot-long, critically endangered Indian crocodiles who take exceptionally good care of their young. Come and experience YogaQuest, a blend of yoga and fanfiction storytelling led by certified yoga instructors. Experience a yoga workout experience and a story at the same time. Work on your reptilian flexibility (and MST3K love) with this week’s theme: Reptilicus! When: Wednesday, April 19th at 7:00 p.m.
Join your fellow Whovians and trivia fanatics at the Driftwood Char Bar on Wednesday night for Minnesota’s only regular Doctor Who trivia night, brought to you by the creators of TC Trek Trivia. This is an all-ages event with no cover, so expect seats to go quick. When: Wednedsay, April 19th at 7:00 p.m.
Come to Modist Brewing for a night of video-game trivia (in which you can win a pair of tickets to GlitchCon) and access to the Minnecade, GlitchCon’s one-stop arcade full of local game creations. This is the last of four brewery events hosted by Glitch ahead of GlitchCon 2017. Trash Film Debauchery presents Cabin Fever, directed by Eli Roth with Rider Strong and Jordan Ladd. Come for the classic horror movie set up of attractive young people traveling to a woodland cabin and stay for innovative gore and a horrifying flesh-eating virus. This screening is part of Trash Film Debauchery’s series on infection. When: Wednesday, April 19th at 6:30 p.m. This is a six-week class intended to use the flow of yoga to get your creative juices flowing. This class features a mix of hatha and restorative yoga, and provides a creative outlet at the same time. The $15 cost covers the class, and provides access to markers and paper to express yourself. When: Wednesday, April 19th at 5:30 p.m. When: Thursday, April 20th at 5:50 p.m. Co-Op Talk is a monthly discussion of interactive media and digital games held at GlitchHQ. The event begins with a short time to mingle and chat with snacks and refreshment followed by this month’s discussion topic: “Mastering Games: From Maxed Skills to the Absurd,” led by Stefen Menzel and Max Schlatter. When: Thursday, April 20th at 6:00 p.m. The Minneapolis Institute of Art’s free Third Thursday event goes nerdy this month with Nerd Thursday, featuring your friends here at Twin Cities Geek and other local nerd groups! Scope out the Guillermo del Toro exhibit, do some Crimson Peak yoga with YogaQuest, catch some PowerPoint Karaoke, appreciate monsters with Reverend Matt’s Monster Science, learn with the Nerdery, play board games, have fun in the photo booth, and more. This event is free; refreshments are on sale. Mystery Science Theater 3000 is back, and Bauhaus is screening episodes of the new season at their taproom. Steel yourself for some terrible movies with a beer, and grab some empanadas while you’re at it from the Midnord Empanada Truck. Snacking starts at 6:00 and showtime at 7:00 p.m.; stay sane with the help of your friends (robot and otherwise). When: Thursday, April 20th at 6:30 p.m. When: Thursday, April 20th at 7:00 p.m. When: Thursday, April 20th at 9:00 p.m.
Can Can Wonderland presents a weekly variety show. The night will play out in four acts, with musical accompaniment from a house band and local celebrity hosts. You never know what you’re in for. This is a 21+ event. When: Friday, April 21st at 1:30 p.m. and Saturday, April 22nd at 9:30 a.m. This is a two-day costuming workshop covering the practical basics of making costumes. The event features local costume pros Rich Hamson and Kathy Kohl, with decades of experience behind them. Learn the basics of fitting sessions, slopers, hand-stitching, and sewing-machine use, and create a custom pattern. Tickets are $100, which includes materials. When: Friday, April 21st at 6:00 p.m. Yet another event this week at GlitchHQ, Lounge 2.0 is a get-together for people who are passionate about games and want to spend their Friday nights in like-minded company. Glitch offers consoles, PC stations, and tabletop and digital games. If you’re passionate about a game, bring it to share with the community. When: Friday, April 21st at 6:00 p.m. to Sunday April 23rd at 6:00 p.m.
Come to Fantasy Flight Games for a whole weekend of Settlers of Catan fun. There’s fun for all sorts of Catan fans here, from ginormous games (with up to 88 players!) to family-friendly games like Catan Junior and sneak peeks at new events. The cost for this event is $35; see the website for more details on the schedule. When:Friday, April 21st at 8:00 p.m. When: Friday, April 21st at 11:59 p.m. Midnight Madness returns to the Uptown Theater in Minneapolis for a screening of Cowboy Bebop: The Movie, featuring the coolest crew of space bounty hunters in the system. The film is presented with subtitles and costs $9. When: Saturday, April 22nd at 9:00 a.m.
Come together with fellow geeks to make a difference and clean up for Earth Day! The plan is to meet at Waterbury Center and carpool out to a site to clean on Saturday. This is a kid-friendly event! When: Saturday, April 22nd at 8:30 a.m. When: Saturday, April 22nd at 10:00 a.m.–Sunday, April 23d at 5:00 p.m. This exhibit explores the dynamic 40-year history of Penumbra Theatre in the Twin Cities, ranging from social justice to the black arts movement. Stories are told from the perspective of a variety of creatives and artifacts. You’ll be able to see artifacts from the theater and experience a set from the play Fences. When: Saturday, April 22nd at 10:00 a.m. When: Saturday, April 22nd at 11:00 a.m.
A Minnesota coalition of people from all professions and walks of life, including nonprofits, labor unions, and religious groups will march on the state capitol to show support for higher education, discovery, and access to scientific information. Help support evidence-based policy and defend science funding in the face of the current political situation. This is a free event, but if you want to help out financially with march costs, check out this this Crowdrise site. There will be a kids-specific march as well. When: Saturday, April 22nd at 2:00 p.m. This three-hour class is for writers who are serious about writing apocalyptic fiction. It examines sources like Black Mirror, Mad Max: Fury Road, and The Walking Dead and makes a deep dive into the literary tropes involved and what makes them work, or not work. This is a project of the Minneapolis Storytelling Workshop; registration is $75 and should be done online. When: Saturday, April 22nd at 5:00 p.m. This event is a great opportunity for Star Wars geeks to learn to cross-stitch, or practice their skills with a cool geeky pattern. Kris Heding will lead this class and teach cross-stitch basics. While the event is free, it’s strongly recommended that you pick up a copy of Star Wars Cross Stitch Kit:12 Iconic Patterns from a Galaxy Far Far Away and the materials for the Star Wars logo and Yoda from that book. When: Sunday, April 23d at 4:00 p.m. The Saber Legion hosts meets at USA Karate. Come on down to just check it out, or get involved in formwork, dueling or sparring to get your jedi on. See the website for protective gear requirements and rules for this demanding and geeky martial art. There is a monthly fee of $10 for use of the space.